He helped my husband and I find the perfect home and close all within 6 weeks ! He's great ! He answered all our questions and we had tons of questions. We are also a military family, he was very knowledgeable regarding VA information too! Gary's great we have done five transactions with him he really is the best. Would recommend anyone to Gary and I do. Gary helped me get into commercial real estate which helped me quit my job. Now I just take care of my properties and spend time with my family. Every transaction with Gary has been wonderful! He is a very straight up guy and gets the job done with as little hassle for anyone including me which I greatly appreciate! It's good being King and a true professional! Absolutely loved working with Gary. I have worked with Gary Cox on three home sales in Wasilla & Anchorage Alaska, and would honestly rather do business with Gary than anyone. Gary is extremely knowledgeable, very responsive, and his experience makes the transactions smooth, and positive. He is an absolute pleasure to work with. Since relocating back to my homestate of Michigan, I will refer my Alaska clients to Gary, as I know they will be treated exactly as I would treat them. A true industry professional. Thank you Gary. Gary is awesome! He's the real deal folks: a realtor who truly has the best interest for his clients at heart. We will only use Gary from here on out for our Alaska real estate needs! Back in 2014 I was looking for a house to meet my needs and my new bride's needs. I was very specific in what I was looking for. Gary did his best to find the perfect match according to my request. Long story short we looked at 27 properties and not once did Gary complain or try to encourage me to buy something I did not like or was not sure about. He has to be the most patient Reality Agent I have ever met. He is also very proficient, professional and high speed. A King in Reality In Deed!!!! Thank you Gary. I took the First Time Home Buyers course at AHFC and was told to find a good realestate agent to work with, that's when I met Gary. He saw me through the entire process over the course of six months and I couldn't be happier with the end results. Gary Cox is the only reason I am a homeowner today and I would recommend his services to anyone. Gary is a pleasure to work with making the process of buying and selling fun and painless. Even after the sale, Gary has been a good source of information on market trends and recommendations on local contractors. A couple of good and trusted friends of mine both highly recommended Gary as an agent to sell a triplex in June 2014. His knowledge of the market, and his skills and marketing skills, and his brilliant ways of thinking of out the box to find ways to make things work, were invaluable. He did a fabulous job listing, marketing, and selling the property at a decent price, and within the timeframe he layed out - everything went smooth and on time with no surprises. He went above and beyond to explain everything to me, walk me through the process, and he & his assistant Jill, took care of everything. He has a can-do attitude and I love his "thinking out of the box" for creative ways to make things work. Enjoyable to work with, and very enthusiastic! I will use him again, and highly recommend him!! Gary provided the most exceptional customer service I've seen of anyone in the service industry in years. I'm recommending him to anyone and everyone I hear of who is looking to buy or sell because of the service Gary provided to our family! As an out of state owner and seller of a residential property, Gary helped us by listing and maintaining the property until it sold and closed. He further helped us through the maze of working with the title company, buyer's lender, homeowners association, and various contractors to get the home ready for closing. Alaska has a cumbersome closing process compared to other states, and Gary was very good at getting us through all of that. He even arranged for the sale of our furniture so that we did not have to move it. We would recommend him highly. Gary Cox is a great Real Estate Agent! I interviewed 3 before I came across him. He did not pressure me about settling for a home and trust me, we probably looked at 25+. He even advised me on a good or bad buy throughout the home buying process. I still turn to him if I have any questions as his knowledge about real estate is irreplaceable! I would highly recommend him as he also brings a ton of humor to the table. Gary Cox knows the city very well. He will work on HUD homes which are difficult to process and in the end got us the house we wanted. However he has poor communication skills and will avoid you if he doesn't have an answer for you rather than tell you he doesn't know something. He worked hard at finding us a lender, but overall was frustrating to deal with. That said in the end we got our house. Gary was great when we sold our house in Anchorage. His knowledge of the local area and the value of houses was instrumental in selling our house on time and within the price range we wanted. Our experience with Gary was excellent and I would recommend his services as a real estate professional. I've dealt with a large number of real estate agents over time. Most of the time I've been left wondering how much they did. With Gary I was very impressed with the results he attained for me. I was surprised by the price and terms we were able to negotiate on multiple offers. He was very impressive! Another important aspect of working with Gary is that he enhances your results and comfort with a large knowledge base in the local real estate market. He has done it all and is very willing to guide you to the best outcome grounded in personal experience. He has saved me a bundle of money, before and after the sale. Gary helped sell our house here in Anchorage last year and all we have to say is "excellence!" That's what he is. He knows his work, he's very personable, professional and wants to see the best possible outcome for his clients. We thoroughly enjoyed working with him and would recommend him to anyone wanting to sell their home. Thank you Gary! Our family moved to Anchorage from the lower 48. We first met Gary after I made an inquiry on google and received a call over the phone. Without any pressure from Gary, he stayed in contact with us till we began our relocation. With the aid of Gary, my husband and I were able to find a home while each of us were in different states. Once we found a house, Gary helped to expidite the entire sale and get us moved in within a short time frame. We would definately recommend Gary Cox for anyone's home buying/selling needs! I worked with Gary Cox for about a year or so trying to find the "perfect home" for my family and we were successful! Just when I wanted to give up and lose all hope Gary was able to guide me through the entire home buying process. He's patient and very responsive and would recommend him to my family and friends who I know are looking to buy a home. We worked very diligently together on numerous hurdles to purchase my home, he never gave up on me and kept moving forward and we were able to build the trust to make 100% sure I could buy my dream home and WE DID! Thank you to Gary for helping our family's dream come true, my kids now have a home to grow up in. God Bless You. Gary and I have a long history of real estate transactions but most recently he was my representative on a commercial property here in Anchorage. Utilizing his business connections he was able to quickly engage a qualified buyer. He and his admin assistant provided excellent communication throughout the sales process. The sale closed without issue, at a fair price and and in a very reasonable time period. Gary was a pleasure to work with and I'd highly recommend him as a buyer's or seller's agent for commercial or residential property. Initially i attempted to sell my four-plex in Anchorage myself using craigslist, thinking that I would be able to make some extra money by saving on any commission that a realtor would charge. Well that didn't work out too well. Gary was one of the few people to respond to my ad, and I agreed to have him come out for a free consultation and market analysis. Immediately I could tell that he was a person who got things done, and he is willing to do so at a lower commission than most realtors. Our property was not without its issues....in fact it had many issues that under most circumstances would have prevented it from being sold. Gary never lost faith or patience with us and the fact that he would be able to sell our property. He worked relentlessly to correct the problems that we had with the property and to satisfy the home inspection requirements. I can honestly say that he is the best and hardest working realtor I have met or dealt with in my many years of real estate experience. I've rarely met anyone with such boundless energy and who takes so much joy in what he does. I also hear he is a pretty decent golfer! I would recommend him for any person looking to buy or sell property, whether it be a single family home multi-family investment. You cannot go wrong with Gary! Gary was very skilled in the process to sell our home. Within days of Gary listing our home we had several offers. When our buyers experienced a last minute financing glitch he assisted them with their realtor to locate a new lender. He scheduled tours for us to find our new home and when we did he expertly negotiated the purchase. Selling and buying a home are two of the most difficult stressful tasks we can do. We are very grateful for the experience and skills of Gary Cox, a seasoned professional. We highly recommend you give him a call. Best realtor on the market! After months of hard work we found the perfect home. Gary looks for the best interest of the buyer, not himself. He did not hesitate advising against buying a home when it was not economical. He sold me the best deal on the market. Worked with Gary to score our family an owner occupied 4-plex. Not only he is extremely knowledgeable in closing process and local market, but is really a fun to work with and is a great coach on investment strategies. Always approachable, positive, respectful, professional. Gary set the showings for all my inquiries, always crunched down ROI numbers and NEVER made me feel uncomfortable for wanting to see new listings while we had the offers in. Offers were submitted in a timely manner, communication was impeccable! When there were issues with repairs at closing Gary went out of his way to represent my interests, even threw a free trash haul of construction debris from the site that was left behind by the seller's contractor. Gary is funny and made my children very comfortable at showings when they got to join. We really got a royal service from the Real Estate King! Only Gary for my next RE transaction! I asked a question on the website about a listing that I also found on craigslist for rent, and he called me within minutes! In addition, he is checking it out to see if it is a legitimate rental for the summer. Great service and VERY helpful! Impressed with his dedication on a Sunday afternoon and a Monday! Thanks Gary! From the day I contacted Gary and asked to be my realtor he was there for me when I needed hi. If I left him a message contacted me immediately and had the information I needed right at his fingertips. Really enjoyed working with him. I had the opportunity to work with Gary Cox in November 2014. I was impressed with his professionalism. I am a Certified Notary Signing Agent and received the documents via email to take to the seller and obtain signatures. Mr. Cox effectively communicated the requirements for the assignment and the assignment was completed without problems due to his advance preparation. Payment for my services was made immediately. I would recommend Mr. Cox to anyone that needs a Real Estate Professional! Made the whole process of buying my first home super easy. Very knowledgeable and honest (rare now a days). Fast response to my questions or concerns. Took the extra mile to assist us with issues we had upon moving in. Awesome work ethics!! Totally recommend!! Gary took us through our first major home-buying effort in many years. We were planning a move from rural Alaska to Anchorage, transitioning into retirement, etc., and he was sensitive to our needs and wishes throughout the process. Gary also has GREAT contacts in the mortgage market and got us a loan when many places, our bank, our credit union, etc., were not routinely making loans. We were thoroughly pleased with our home buying experience and I'm grateful to Gary for guiding us through the whole experience. I worked with Gary for years to purchase and sell homes for me and really can’t say enough good things about him. Gary is knowledgeable, approachable, personable, endlessly patient, and incredibly generous with his time (including mornings, evenings, and weekends over the course of several months). He answered every question and explained every form and every part of the process clearly and thoroughly. Buying a home in this market is challenging, but working with Gary made it as painless and straightforward as possible. I highly recommend him. Amazing realtor. He even took time away from his super busy schedule to help me out with a personal favor. I consider him a true and genuine friend. Gary is incredibly knowledgeable and well connected in the industry. He knows how to get things accomplished the right way and not waste your time. We were very fortunate to have had the pleasure to work with Gary buying our home. He is called "The King" for good reason. For some this name may seem cliche or corny, but not for this guy, it fits him well. Gary was very helpful working for our best interests. Communication was good with Gary during our selling the old place and purchasing the new place. The above events pretty much happened simultaneously and we couldn't be happier. We would use and do recommend utilizing Gary's knowledge and skills as a realtor. Gary is the KING! Gary is hands down, the best realtor I've ever worked with. He worked day and night until we found the perfect house for us. We felt like we were his only client because of the personal attention he gave us. Though, we knew he was probably one of the the busiest realtors in the business. Gary Cox has assisted me in finding the perfect house for me on 2 occasions. He worked very hard both times to understand & meet my housing desires. I would recommend him to anyone. Gary helped our family buy a house. He is very knowledgeable and very very patient. We must have looked at 50 places before we found the right one! He even helped us navigate developing our existing property into a rental. 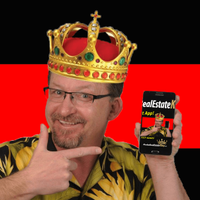 I would recommend Alaska Real Estate King for all your real estate needs. We enjoyed working with Gary, even my kids! He is very professional, quick with responses, very approachable and available to answer any concerns almost immediately. He is one of those outstanding, high quality agents that work for you and with you making a house purchase a breeze. We wanted an investment 4plex and Gary was right on task crunching the numbers and advising professional contacts to consult regarding estimates to repair. And he was funny making a house purchase a lighter event, the King delivered! Couldn’t ve been happier and will stay with Gary to help us again in the future with real estate. It's always a pleasure working with Gary on a transaction! Gary strives for a win-win for both buyers and sellers and is truly professional in all he does! He doesn't focus on the problems, he focuses on the solutions and that's just part of what makes him a great realtor! Gary and Kris did an excellent job for us! They really went above and beyond. Their communication was much appreciated throughout the process! My wife and I definitely recommend their services and will use them again! I have been in the industry for over 3 decades and have worked in one aspect or another will 100s of realtors. Gary Cox is one of the most knowledgeable, fair, and hard working realtors I've come across. He will bend over backwards to put a deal together and I've watched him do just that many times! I highly recommend Gary to anyone who is wanting to buy or sell real estate. He will get top dollar for your home as a dedicated, honest and fair professional. He will work with you from any part in Alaska. He helped me as I was working on the Northslope at the time. Gary has been really helpful when we purchased our first rental property he is very knowledgeable on what is a good buy and what we should be looking for. He also gave a suggestion on a single family property that was up for bid and was a better deal than what we were originally looking at and it was in better shape then the one we were looking at. Thank you Gary for being very patient with me during the 27 houses we viewed and for not trying to push me into something I didn't want. We purchased a new home and sold our house with Gary’s assistance. Gary is a great agent willing to share his knowledge and time. We had a very pleasant experience and would recommend him to any of our friends because of his professionalism, patience, easy going personality and positive attitude. After moving on from a couple realtors, I was fortunate enough to find and work with Gary Cox to purchase my first home in Anchorage, Alaska. The great thing about Gary is that he's always available no matter the time of the day. He's a great communicator, but most importantly, he is kind, generous, and a great listener. He's never pushed a home on me and finally, a fter looking at over 30+ houses, we were able to secure a home before it was even posted on the MLS. Thanks to his expertise, I still have the house and am happy as the first day I saw it! Thank you again, Gary Cox, for being an awesome real estate agent! Gary is very driven and will always go the extra mile to help you understand the market and find the right home. Not only am I a satisfied customer I have referred him to multiple friends who became satisfied customers. Helped us in the real estate market in Anchorage with buying a home that fit our budget and our family needs. Very good real estate agent to work with for buying or selling a home. Knowledgeable about the real estate market both current and future conditions. I watch Gary work every day and I see how he takes care of his Anchorage real estate clients. He starts early in the morning and works late every day. House into homes. People into clients. Clients into friends. Gary Cox has been our realtor for 2 home purchases and 1 sale. He knows the business. Personable and helps you find what YOU want. There are many reasons Gary is the Real Estate King of Alaska. Gary is tenacious with detail, follow through and communications. He is as 'on-top' of the process as any real estate professional out there YET- he is completely relaxed and no-pressure with his clients. I've known Gary for many years both personally and professionally. He refers our Allstate agency to his clients -so my team and I frequently have the opportunity to talk about their experience working with Gary - they LOVE him. 1. He never pressured us. If he even sensed we had the slightest hesitancy on a property - he would say- "let's keep looking". He didn't want us to settle for less than the perfect place for us. We found the home we wanted to buy- not the one he wanted to sell. 2. They also say; He never gave up on us - even when we were becoming discouraged by things like financing or inspections issues - he was our champion and our encourager. If it weren't for his tenacity and kindness we wouldn't have been able to get into the perfect place for us.